Many assume they are the same thing, but in reality Alzheimer’s disease is only one type of dementia. It is, however, the most prevalent type accounting for 60 to 80 percent of cases according to WebMD. So what is the difference between Alzheimer’s and dementia? And what does it mean for you or your loved one? Dementia is not a disease in and of itself; rather it’s a term that describes a group of symptoms associated with a decline in thinking, reasoning and/or memory that impairs your ability to perform daily activities. It’s important to note that although age is a risk factor in some types of dementia, ‘senility’ is not a normal part of aging as once thought. Dementia is actually caused by damage to brain cells with different types affecting different parts of the brain. After Alzheimer’s disease, vascular dementia, which occurs after a stroke, is the most common. However, there are a range of conditions that can cause symptoms of dementia. While many dementias are permanent, starting slowly and progressing over time, some can be reversed such as those caused by thyroid problems and vitamin deficiencies making early diagnosis vital. Someone in the United States develops Alzheimer’s every 65 seconds. 7 Million Americans are living with Alzheimer’s in 2018 and by 2050, this number is projected to hit nearly 14 million. One in 10 people age 65 and older has Alzheimer’s disease. Early-Stage – Still mostly independent but repeats questions or comments (often within the same conversations), misplaces objects, may avoid activities, has mood changes and difficulty understanding and recalling new information. Middle-Stage – Daily support is often needed and you’ll notice greater difficulty communicating in social situations, increased irritability, more withdrawal from regular activities, more frequent memory issues, disorientation even in familiar environments, difficulty with judgement, lack of awareness of time and personality or behavioral changes. Late-Stage – Care is needed 24/7 and your oved one will have difficulty recognizing familiar people and/or family, they will spend much time sleeping, will lose motor skills and sense of touch as well as needhelp bathing and toileting. There’s no one test that diagnoses dementia or Alzheimer’s disease. It’s based on medical history, physical and neurological exams, lab tests, brain imaging and the signs we’ve described above. While dementia itself can be pretty clearly determined, the specific type may not be because some symptoms and parts of the brain affected can overlap. Dementia treatment depends on the cause. Currently, there is no cure for Alzheimer’s disease. But, treatments to slow symptoms and improve quality of life are available. And worldwide research continues. In fact, 90 percent of what we know now know about Alzheimer’s has been discovered in the last 20 years according to the Alzheimer’s Association. While there are a number of risk factors that can’t be changed such as age, family history and genetics, studies now suggest that how you age may make a difference in keeping your brain healthy and reducing your risk for Alzheimer’s. Maintaining a healthy diet, staying socially active, avoiding tobacco and excess alcohol and exercising the body and the mindare key. If and when your loved one needs care outside the home, assisted living and memory care are the two most common options. Assisted living provides housing and support with activities of daily living such as medication management, bathing and dressing. Sonata communities offer onsite medical care, emergency call systems, wellness programs, a calendar of social activities, daily meals and transportation. Memory care is designed to nurture those with Alzheimer’s disease and dementia with specifically trained staff and individualized support. You’ll find 24-hour supervision and an environment that is easy to navigate, is secure and may also use soothing colors and lighting. Plus, memory care communities enhance quality of life through therapy, structured activities, social opportunities and even dining options designed to enhance nutrition and independence. Keep in mind that memory care may also be found on the same campus as assisted living ensuring a smooth transition as care needs evolve. 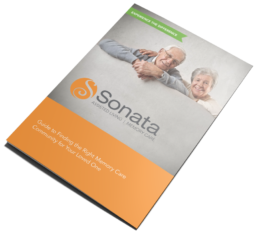 For more information on the assisted living and memory care options you’ll find at Sonata, call a community near you today or schedule a visit. Because we want you to make the best possible decision for your loved one, we created Guide to Finding the Right Memory Care Community for Your Loved One. This comprehensive resource discusses every aspect of memory care, from nutrition to costs and financing solutions. Download it with our compliments to learn more. Looking for the right memory care community can be challenging. You want to make sure you find the best place for your loved one, while dealing with a range of emotions. The entire family feels the impact when a loved one is diagnosed with Alzheimer's or a related form of dementia.